For the first time in its history, the U.S. Army Corps of Engineers will have to disclose the amount of pollutants its dams are sending into waterways in a groundbreaking legal settlement that could have broad implications for the Corps’ hundreds of dams nationwide. 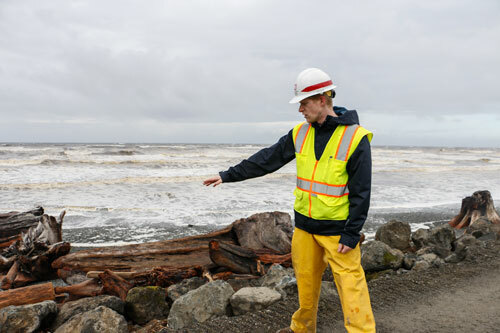 The Corps announced in a settlement on Monday that it will immediately notify the conservation group that filed the lawsuit of any oil spills among its eight dams on the Columbia and Snake rivers in Oregon and Washington. The Corps will also apply to the Environmental Protection Agency for pollution permits, something the Corps has never done for the dams on the Columbia and Snake rivers. The settlement filed in U.S. District Court in Portland, Oregon, ends the year-old consolidated lawsuit by the conservation group Columbia Riverkeeper, which said the Corps violated the Clean Water Act by unmonitored, unpermitted oil discharges from the eight hydroelectric dams. The settlement reflects the recent tack of the EPA regulating the environmental impacts of energy. The agency has recently come up with regulations of mountaintop removal for coal and fracking for oil and gas. As part of the settlement, the Corps admits no wrongdoing, but will pay $143,000 and the consolidated cases were dismissed. 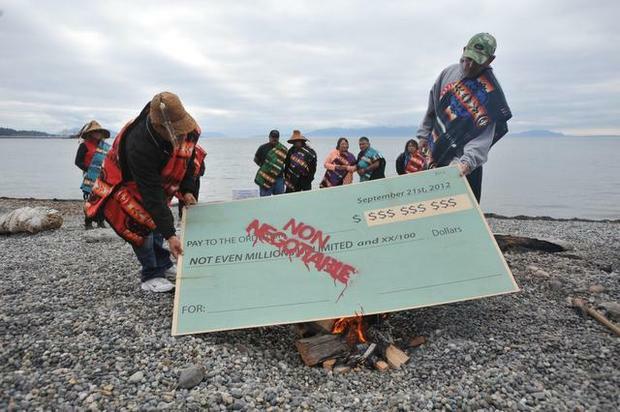 When contacted by The Associated Press, the Corps’ Northwest and national offices requested questions via email Monday and did not immediately comment on the settlement. The settlement will allow oversight of the dams by the EPA. The agency had the authority to regulate the dams’ pollution before the settlement, but it could not compel the corps to file for a pollution permit. The Corps will also be forced to switch to a biodegradable lubricant for its dam machinery if an internal study finds that it’s financially feasible. The Corps isn’t just a polluter, however. It’s also a regulator of pollution under the Clean Water Act. 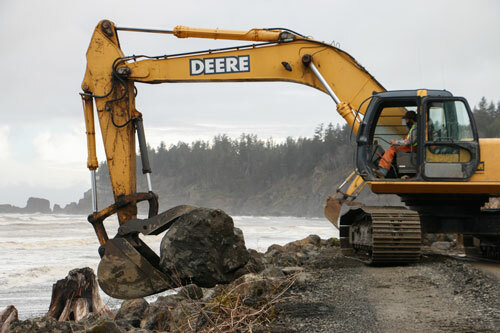 The act grants the Corps the authority to issue permits for the discharge of materials excavated from or put into U.S. waterways. Monday’s settlement will force the Corps’ hand. To discharge pollutants into waterways, the polluters must obtain permission from state and federal governments. Before the settlement, the EPA knew about the unpermitted discharges from the dams, but the Corps said in letters to state agencies that it is not accountable to the EPA. The Corps argued in the same letters that disclosing the mechanical workings of the dam as part of an oil-discharge summary could compromise the dams’ security. 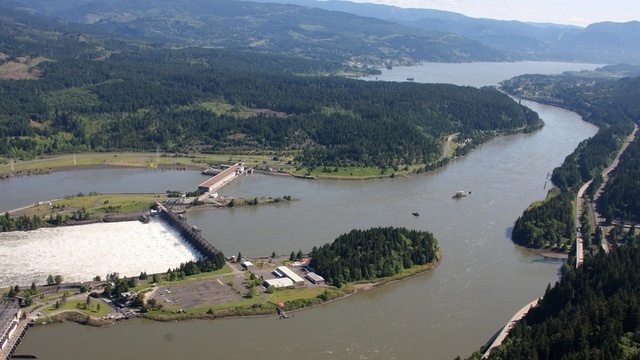 In July 2013, Columbia Riverkeeper sued and demanded to know what the Corps was sending into the water and how much of it was going in. “When you’re not regulated under a permit, you don’t have to say what the impact (of pollution) on water was,” Powers said. Nationally, the settlement could force all unpermitted dams to obtain National Pollutant Discharge Elimination System permits from the EPA. Daniel Estrin, an environmental law professor at Pace Law School in White Plains, New York, said the settlement will make it impossible for the Corps to say that all of its pollutant-discharging dams don’t require discharge permits. 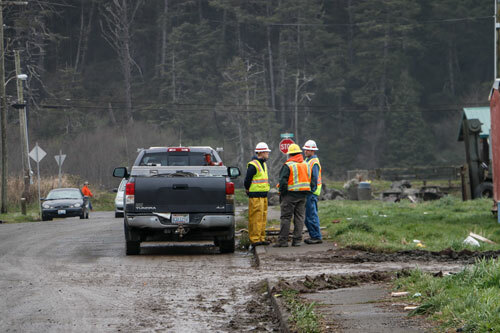 “The Corps’ acknowledgement of the need for permits in this settlement will make it difficult for other owners to successfully deny that permits are required in the face of citizen suits like the one brought (here),” Estrin said. The eight dams affected by the settlement are the Bonneville, the John Day, The Dalles and McNary in Oregon and the Ice Harbor, Lower Monumental, Little Goose and Lower Granite in Washington state. 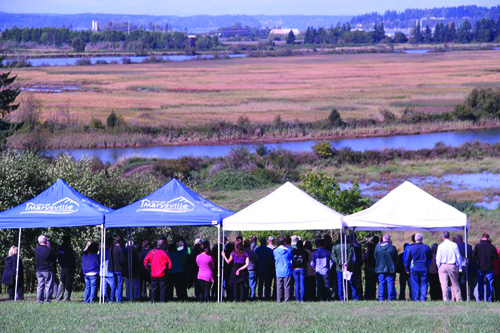 Environmentalists will be closely watching the type of permit issued by the EPA, Powers said. 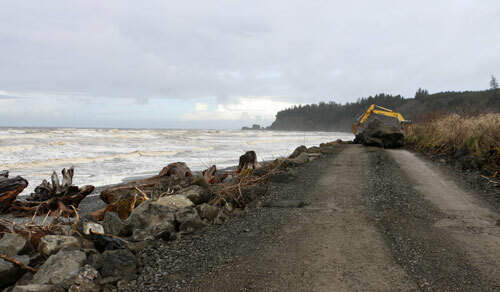 A “site-specific” permit would likely include limits that the Corps would have to meet on the amount of oil discharged. If the EPA instead issues a general permit, environmentalists would be less sanguine about its prospects, Powers said. General permits are less effective in compelling change because they are issued without specific metrics that must be met, she said. In 2009, the EPA found a host of toxins in fish on the Columbia River, including polychlorinated biphenyl, a potentially carcinogenic synthetic that was banned for production in the U.S. in 1979. The eight dams use turbines that have shafts and hubs filled with oil or other lubricants. The oil leaks to the surface, along with oil from drainage sumps, transformers and wickets that control water flow. 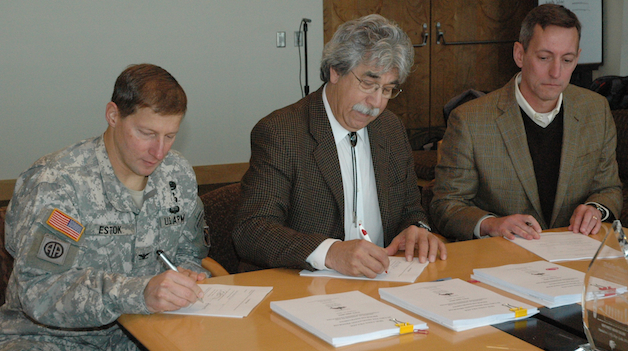 Col. Bruce Estok, district commander and engineer of the U.S. Army Corps of Engineers’ Seattle District, joins Tulalip Tribal Chair Mel Sheldon Jr. and David Allnutt — director of the Office of Ecosystems, Tribal and Public Affairs for Region 10 of the Environmental Protection Agency — in signing the first Native American In-Lieu Fee Program in the nation for Quil Ceda Village on Nov. 26. 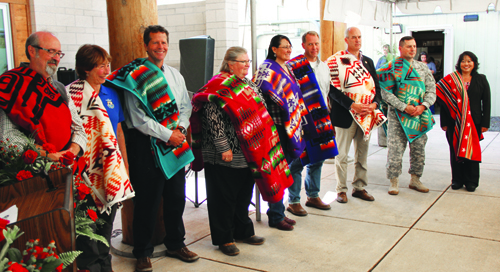 TULALIP — Representatives of the Tulalip Tribes, the U.S. Army Corps of Engineers and the Environmental Protection Agency sat down together on Tuesday, Nov. 26, to officially establish the first Native American In-Lieu Fee Program in the nation, for aquatic resource impacts and compensatory mitigation. Tulalip Tribal Chair Mel Sheldon Jr. was joined by Col. Bruce Estok, district commander and engineer of the Army Corps of Engineers’ Seattle District, and David Allnutt — director of the Office of Ecosystems, Tribal and Public Affairs for Region 10 of the EPA — in signing an ILF Program Instrument for Quil Ceda Village, with the purpose of providing compensation for unavoidable impacts to wetlands and other aquatic resources, resulting from construction projects within the boundaries of Quil Ceda Village itself. 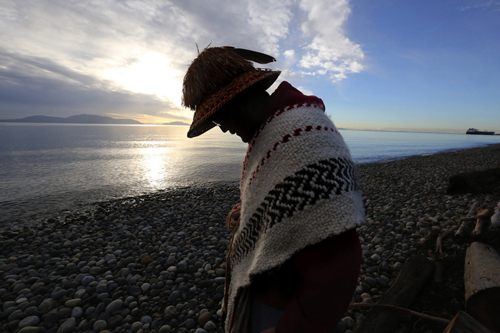 Sheldon credited Terry Williams, the Fisheries and Natural Resources Commissioner for the Tulalip Tribes, with seeing this program through since he started working with the Tribes. 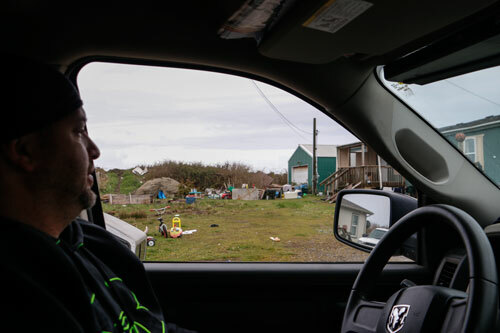 Sheldon went so far as to describe the Quil Ceda Village ILF Program as vital to the future of the Tulalip Tribes. The ILF Program will use a watershed approach to locate mitigation projects, and provide consolidated mitigation targeting specific priority habitat, water quality and hydrology functions, based on the critical needs of each sub-basin within the Quil Ceda Creek watershed. “We may not realize how big this is now, but generations down the road will be thanking us,” Sheldon said.